Connect a TV, VCR, DVD, TAPE DECK and A/V Receiver. o Composite video cables, stereo and digital audio cables, RF coaxial cables. You can hookup tape and disc players/recorders. o Record TV programs to VCR. o Watch DVD-Video with surround sound. 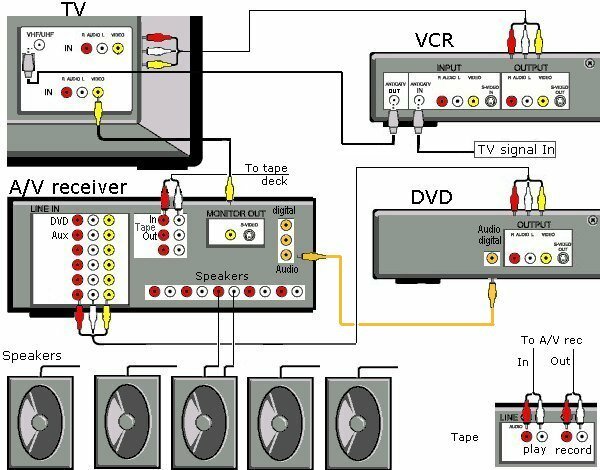 The TV will need to be set to Line 1 (L1) to receive the video output from the A/V receiver or Line 2 for VCR. The TV signal comes in to the VCR and is passed thru to the TV when the VCR is off. The tape deck uses two analog RCA (red & white) cables for play and two for record.